VietNamNet Bridge – The ASEAN Football Federation (AFF) has announced Vietnam will play host to the 2014 AFF U19 Youth Championship due to take place at Hanoi’s National My Dinh stadium from September 5-13. So far Thailand, Indonesia, Myanmar, and hosts Vietnam have registered to participate in the tournament, according to the AFF. To promote the tournament, the AFF has invited non-ASEAN teams to join the contest, and it has got the nod from Australia and Japan. 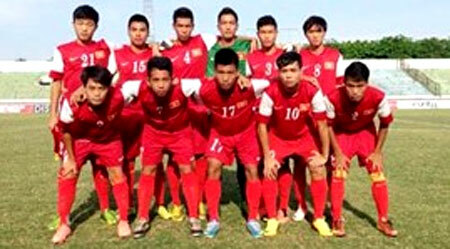 U19 Vietnam will again play U19 Japan, which defeated the hosts 7-0 at the recent 2014 International U19 Nutifood Cup at HCM City’s Thong Nhat stadium. The tournament is also an opportunity for Vietnamese players to prepare for the final round of the Asia Football Confederation (AFC) U19 Championship to be held in Myanmar this October. Vietnamese players are currently training in the UK. They will play the first match against U19 Arsenal team at Colney stadium on March 5 and move to Wembley stadium the following day to watch a friendly match between England and Denmark.